Click on links for additional photos or information. We made a brief trip to get a dose of grandchildren, children and friends--always needed after a time away. Made some plans for the fall, and then we were off again into the heat of Arizona to prepare for our summer sojourn. We finally got the house in order to leave for the summer and the motorhome packed to leave, it was early June and really hot! Our first stop was Tucson to visit Ray's mother and sister. Ray's mother is doing well in the assisted living where she has been for several months. The road to Milwaukee and AACE Square Dance Convention was slowed by unplanned stops at a Ford dealer in Missouri and a dentist in Illinois. Motorhome needed a brake check and Ray needed a root canal. We made it to AACE in time and enjoyed the dancing and visiting with friends from all over. From Milwaukee, we traveled through Chicago and around Lake Michigan to our son's in Michigan for a visit. 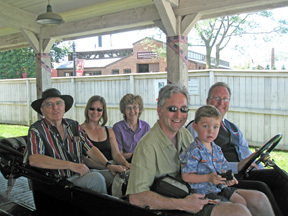 We mostly busied ourselves with things around their home on Cass Lake, but we did visit Greenfield Village where we got to ride in a Ford Model T on a bright sunny day. 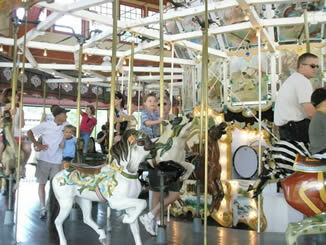 And later Keegan and Paul rode the 1913 Herschell-Spillman Carousel. 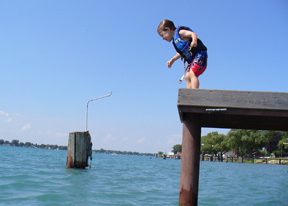 We spent the 4th of July with Paul, Robyn and Keegan at Robyn’s family reunion in Port Lambton, Ontario where Keegan regaled us with his daredevil jumping from the pier into the St. Claire River! We visited friends, Celia and Duane, in Michigan to get a good dose of friendship, bridge playing and just plain kicking back. They are wonderful hosts. Next stop was a visit to our friend, Carol, in Illinois where we did more catching up on our lives more visiting. 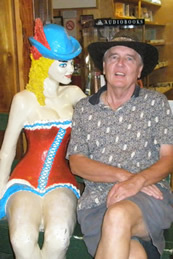 In South Dakota during a visit to Wall Drug, Ray struck up a friendship with this lady. 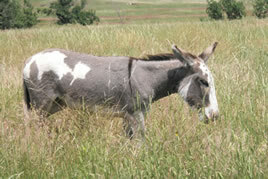 We visited Custer State Park, which is one of our favorites and watched the wild burros grazing. We also visited Wind Cave National Park, which was a first for us. It’s not as big as Carlsbad and not as fresh as Kartchner, but it was very nice. We drove through Wyoming and finally got to see Devil’s Tower National Monument. 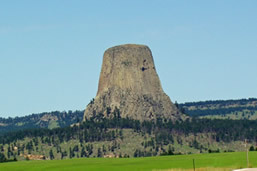 It is 1,280 feet high rock just sticking up in a large flat area of Wyoming. Its visibility from a distance made it an important landmark for early Indians and later trappers and travelers. In 1874 a U.S. Geological Survey coined the name Devil’s Tower, and it became the first National Monument in 1906. By the end of the month we were into Montana. We stopped in Butte to have the brakes on the motorhome looked at again, and lo and behold, someone actually knew what was wrong with it. It was a pump that fed both the brakes and the power steering, which I had long since given up on getting fixed. One days wait while we camped on the Ford dealers lot, and we were off and running again. We drove the car around Butte and saw some of its historic homes, then went to a shopping mall where we got some really great deals. The theater at the mall was showing Mamma Mia so I dragged Ray to see it. He and four other men were in attendance. We camped overnight in a town called Reedpoint, MT, population 96. Ray went for a walk and took pictures this neat place. Next we visited the capital of Helena. The Capitol itself was an impressive structure with lovely grounds. 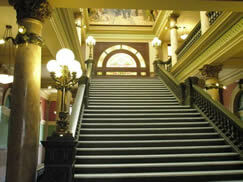 An interior stairway was especially imposing. Another interesting site in Helena was their cathedral, aptly named, Cathedral of St. Helena. 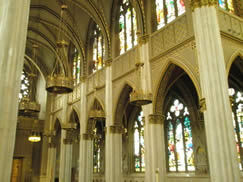 A gothic cathedral in the Notre Dame style of twin steeples with a central rose window, it has imposing interior columns and tall graceful stained glass windows. A nice surprise in this Montana city. Our next stop was in Glacier National Park. We stayed at an RV Park just outside the park entrance and drove into both entrances. 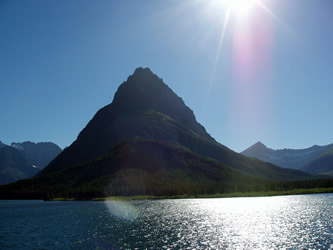 The Rocky Mountains are always spectacular, and Glacier National Park is no exception. 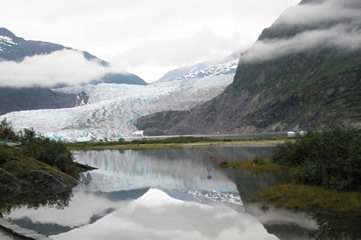 The glaciers themselves, however, are receding rapidly, but there are more than enough around to satisfy any visitor. Everything else about this majestic place was stunning. Soaring mountain peaks, peaceful lakes, roaring waterfalls, raging rivers, and meandering streams were all supersized. We took a boat tour on one of the lakes and gawked at our surroundings during the entire trip. A family of molting mountain goats with their babies was a treat at one of our stops. Time was slipping away, and we needed to be in Seattle by August 7th for the departure of our cruise to Alaska on August 8th. 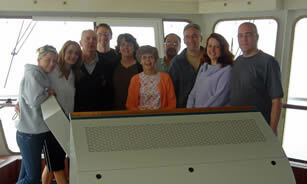 The family and some friends were convening in Seattle for our 50th Anniversary cruise on Celebrity (what else?). Bev, Rick, Selina and Rico were working their way up to Seattle visiting friends and seeing the sights along the way. 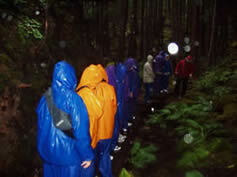 They visited Mount Hood, the Oregon Caves, Mount Rainier, Olympic National Park and many other sights along the way. Paul, Robyn and Keegan flew in to Seattle a day early and visited the Space Needle and other sights there. Lloyd, Mark, Pam, Gail and Monica flew in the day of the cruise, and we all met, boarded, and got off safely. The first night we celebrated Bev and Rick’s 15th anniversary-just a month late, complete with singing and anniversary cake. The following day was our anniversary. 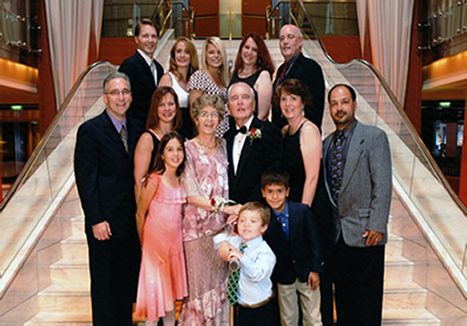 We had the entire day at sea with a formal night for dinner. Early in the day a beautiful bouquet of roses arrived as an anniversary present from the kids and grandkids. Every one enjoyed shipboard activities like swimming, a naturalist lecture and a wine tasting event. No time to be bored, ever. Getting ready for our first formal evening was an event in itself. We had an appointment for photos before dinner, so everyone had to be ready early. We were so elegant we dripped with it! Top row is Mark, Gail, Monica, Pam and Lloyd. Front Paul, Robyn, Selina, Joy, Ray, Bev, Rick and in the foreground, Keegan and Rico. Dinner was served, wine flowed, cake was cut, and champagne was drunk. Friends and family celebrated, and the evening couldn’t have been more wonderful. More photos from the celebration here! 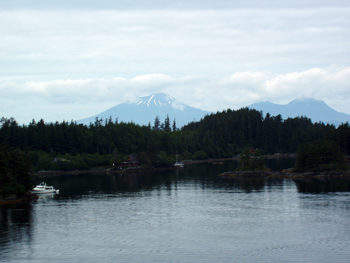 The cruise took us to the Russian settlement of Sitka and its picturesque harbor. In the town we enjoyed the little Russian church and the Totem Park of the natives. The visit to the Hubbard Glacier was breathtaking. Most of the family had never seen glaciers of this magnitude, so it was even more enjoyable to watch them enjoying the visit. Everyone had their own camera and took loads of photos of this site. After deleting the blurry ones, I still had almost 700 photos left. Now I just have to wade through them. We got photos from all angles and lots of calving. The weather was bright and sunny, so everything was spectacular. That evening the ship had one of their silly events - The Not-So-Newlywed Game. Well after a few drinks and prodding by several offspring, we were chosen as one of the couples. And, we won! They gave us a DVD of the whole event for posterity. It’s a hoot! We docked in the capitol of Juneau on a rainy day. We all got off the ship and caught the free town shuttle over the the Mendenhall Glacier. We beat the folks taking the ship tours there, so we had some time to sightsee before the masses arrived. The pond of bright red salmon was there as it had been on our last visit. The visitor center, however, was totally different. A brand new building with sweeping vistas of the glacier. Quite impressive. The hardy folk hiked in the rain to the waterfall, Ray ran around taking photos of a bear on the premises, and we all got to see the things we wanted to. Paul, Robyn and Keegan went on an incredible whale watching cruise in the afternoon which was the highlight of their trip. They saw sea otters, an eagle and 23 Orcas and saw themin a feeding pod. It was incredible. Meanwhile, Mark took the rest of us on a plane trip over the glaciers. He made a deal for a planeload, and off we went. 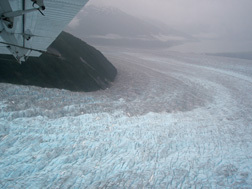 Looking at glaciers from the ground they seem big, but from the air, they are endless and HUGE! It was quite an experience. 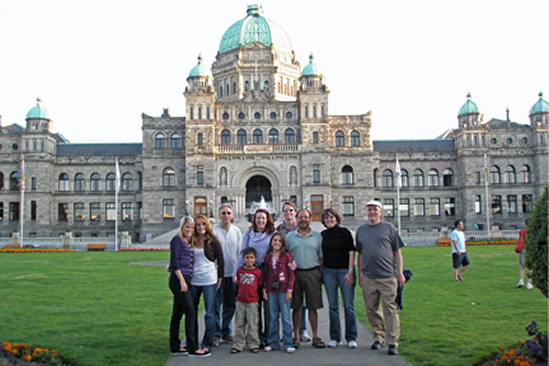 Bev, Rick and family managed to get to the Capitol Complex, which we had visited extensively on our trip several years ago and some other sightseeing in downtown. They took photos in the governor’s office and enjoyed the tour. Pam opted for some shopping, and by this time I was tired and wet. Went back to the ship to relax. We had a relaxing dinner. Disembarkation in Ketchikan was into a downpour. Paul and Gail and families had arranged for us to accompany them on a boat ride to an island and a hike through a rainforest. We had instructions as to where to board the bus and trekked past the ship’s tours to the next section of pier only to be told we were going with the pricier ship’s tour. So back we went. By this time we were soaked, and it was only eight o’clock in the morning. The ride to where we would get the boat took us about 45 minutes, and during this time I had definitely decided I was remaining on the boat while the others hiked the rainforest in the rain. We arrived at our destination and were taken to an awning where we were given “raingear” for the trip. Hooded jacket and pants of waterproof nylon. Don’t you believe it! They were already wet, as was everything else in sight. Next we headed to the pier for our boat. One look at this and I knew I was in trouble. 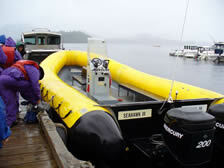 No waiting in a zodiak to be out of the rain. Off we went in this torrential rain in an open rubber boat. I was thinking, maybe a quick zip across a little inlet. No way–another 30 minutes in the rain with water up and over the sides in the gale. When we arrived at the island, the guides assured us it wouldn’t be so bad in the rainforest because the trees would shelter us. Now think about this. Rain on trees equals the same amount of rain, plus the extra that drips off the trees. It was not any drier, believe me. Thoughts of the humid rainforest and its filtered sunshine in our rainforest hike in Queensland, Australia kept me somewhat dry during our hike. At the end of the hike we were promised hot chocolate, which was diluted by the rain, but, nonetheless, hot. We also had cheese and soggy crackers and the most delicious smoked salmon I have had. I had to get back to the ship - my underwear was dripping wet! 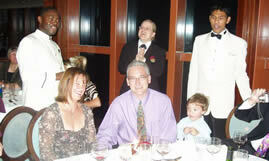 When we dried out, we enjoyed a lovely dinner on shipboard for our last formal evening. We celebrated Paul and Robyn’s 5th anniversary (a few weeks early). Mark had become acquainted with many of the shipboard personnel, and he arranged for us to have a deck tour, which is by invitation only. Everyone received a written notice of the tour and instructions to bring the proper ID for security clearance–everyone, except us, that is. We went with the group to the appointed place and managed to convince security we weren’t terrorist, but rather the parents of the crowd on the tour, so we were about to commence when the couple from the cabin across from us arrived with all the proper papers to accompany us on our private tour. They were not English speaking folks and hadn’t been very friendly thus far on the tour. It didn’t seem to occur to them that they had received their invitation by mistake. When crew members were taking photos of us on the deck, this other couple was in them. Pam was finally the one to say that we would like a photo with just our family. I don’t think they even got it then. Victoria, B.C. was our final stop. We all disembarked and went to seek transportation. On the pier were various vehicles for hire. A two-seater sports looking thing was $60/hour, as was a sedan for four, and finally a good size van that would hold us all. Same price $60/hour. Our driver was a long time resident and full of lots of information. He was a terrible driver, but you can’t have everything for $60/hour for twelve of us. With him whizzing us around we got to see all the important sights with time to spare. Younger folks stopped at a pub in town while us old folks took the kids back to the ship for some R&R. The following day we docked and everyone went their separate ways after a great time together. Lloyd, Mark, Pam, Gail and Monica returned to the Bay Area to return to work. Bev, Rick, Selina and Rico continued their vacation en route back home. Paul, Robyn and Keegan went to visit some of Robyn’s family in Washington. Our friends returned to the Bay Area and their homes. The two of us returned to Camelot and headed a little north to visit friends, Lou Ann and Roger, in Silverdale, Washington. We reveled in their marvelous hospitality and loved their gorgeous home on the Hood Canal. We did some sightseeing with them at Port Gamble and Bremerton. We had a great visit. We worked our way down the Pacific Coast, as is our norm at this time of the year, to arrive in Coos Bay, Oregon for our annual dose of friendship, pinochle playing, visiting, and–of course–eating. A great time was had by all. After our Oregon visit we returned to the Bay Area for our next Anniversary celebration - renewal of our vows and a party arranged by our children. 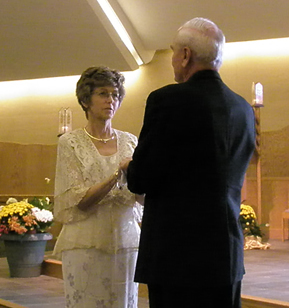 We renewed our vows as a Mass and celebrated with the party afterward. Friends from the area, my maid of honor from Southern California and relatives from Arizona joined in our celebration. It was a wonderful day! We have photos of the events here. 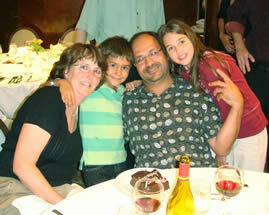 We stayed in California for a while and visited with the family there. Went into San Francisco with the Arizona folks for an evening at a night club and then gathered ourselves together to return to Arizona in October. We then settled in for square dancing to begin again.